2. 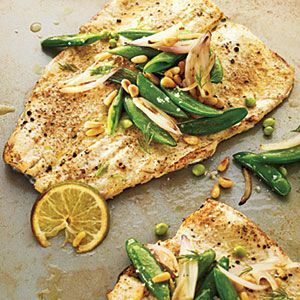 Arrange trout, open with flesh sides up, on a baking sheet coated with cooking spray. Brush flesh evenly with 1 1/2 teaspoons oil. Drizzle juice over flesh. Sprinkle flesh with cumin, 1/4 teaspoon salt, and pepper. Broil 5 minutes or until fish flakes easily when tested with a fork. 3. While fish cooks, heat a medium skillet over high heat until very hot. Combine peas, shallots, and pine nuts in a small bowl; add remaining 1 teaspoon oil to bowl, tossing to coat. Add pea mixture to pan; cook 3 minutes or until peas are bright green and blackened in spots and nuts are lightly toasted, stirring frequently. Stir in remaining 1/4 teaspoon salt and dill. Serve over trout.